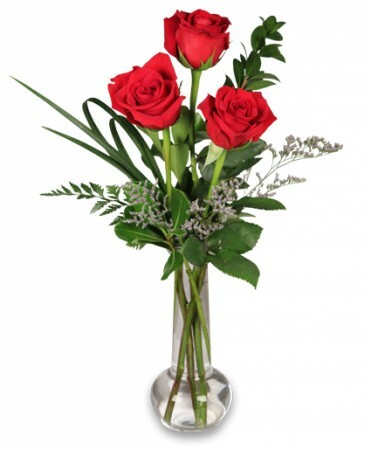 Simple but elegant, three roses in a clear glass bud vase. Rose (Red): Lover's rose, passion. Same-Day Rose Delivery to Fort Worth, Aledo, Arlington, Benbrook, Burleson, Colleyville, Crowley, Haslet, Hurst, Keller, Lake Worth, Mansfield, North Richland Hills, Saginaw, Southlake and Watauga, TX. 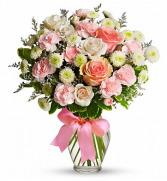 Sending roses an elegant, luxurious and stylishly way to send your message on a special day. Rose Delivery in Fort Worth, Arlington, Benbrook, Burleson, Colleyville, Crowley, Grapevine, Hurst, Keller, Mansfield & Southlake, TX. 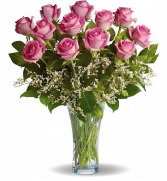 Convey meaningful messages of love, friendship, and appreciation with the perfect gift of one dozen large pink roses in an elegant keepsake vase from your Fort Worth florist. 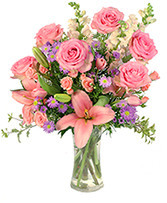 Brighten someone's day in Fort Worth TX with the inspirational beauty of flowers.